As many of you may know, American Express is the Presenting Sponsor of the Rogers Cup tennis tournament in Toronto. As such, they have engaged in a heavy marketing campaign to promote this tennis tournament, including commercials, web advertising and special exclusive offers for card holders. Here is the Roddick vs. Pong commercial that you may have seen on television. If you visit the marketing site that American Express has set up at http://stoppong.ca, you will notice that there is a game that you can play. This Adobe Shockwave based game is based off the old classic game of Pong; however, you control the Roddick character in an attempt to defeat Pong. For anyone that has played this game, what is the secret to winning? I am lucky to even get a couple points off it. Unfortunately, you can't do a drop shot similar to what Andy Roddick does in the commerical. In terms of special exclusive offers for American Express card holders, anyone that attends the Rogers Cup in Toronto with their American Express credit card in hand can take advantage of some exclusive offers. There are preferred ticket access and VIP treatment for card members, as well as access to special events and fundraising initiatives. Also make sure you visit the American Express Courtside Lounge, where card holders can get a relaxing massage, refreshments and more. Other places around the city where you can see an American Express presense promoting the Rogers Cup tennis tournament include the BCE Place on Aug 9-10, Vaughan Mills Shopping Centre on Aug 11-13 and at Terminal 1 of Toronto Person International Airport between July 31 to Aug 13. Last week, there was a rather sizable increase in readership to this blog. This was because Jon Wertheim, a senior writer for Sports Illustrated with a column on the CNN/Sports Illustrated website, linked to my blog. You can find the link on the third page of Jon's July 19th column in the Marginalia section. Apparently, Kevin from Toronto, a reader of my blog, sent this link to Jon. Thanks to both Jon and Kevin for noticing my blog. Jon, if you come to Toronto this year, come by the Transportation desk and say hello. It would be nice to meet the man behind the column and one of my main sources of tennis information. With the Rogers Cup fast approaching, our final preparations for the tournament are in full swing. My volunteer committee, responsible for Transportation of players, officials and other guests at the tournament, had its Orientation meeting, where approximately 115 volunteers in attendance were presented with information about the tournament, and other operational details specific to our committee. Such items included instructions on volunteer-player interaction etiquette (i.e. volunteer cannot ask a player for pictures/autographs while on duty/in uniform, etc), information about the vehicles that we are driving (i.e. instructions on how to best utilize the vehicles that have been provided by Mercedes Benz), directions to the locations that the players would need transportation to, and airport passenger pickup procedures. The Orientation meeting is also a time where many of the volunteers renew acquaintances with one another. For many of the volunteers in our committee, seeing one another for the first time since the end of the previous tournament is an opportunity to strengthen the camaraderie amongst many people from different walks of life that share a common interest, tennis. In my mind, this has got to be one of the greatest intangible benefits of volunteering for this event. While the Rogers Cup tournament officially starts on August 5, the Transportation Committee begins operations on August 2. In the upcoming days, as time permits, I will blog more about the tournament and some of the things that we do. The July 2006 Update Rollup for Windows XP Media Center Edition 2005 (KB919803) was released earlier today. Install this update to get the latest updates for Windows XP Media Center Edition 2005. This update supersedes all updates since Update Rollup 2 (KB900325) for Microsoft Windows XP Media Center Edition 2005 (this includes this package supercedes the April 2006 Update Rollup (KB914548), the January 2006 Update Rollup (KB912067) and Update Rollup KB908250. This update requires Update Rollup 2 for Media Center Edition 2005 to be installed (KB900325). In addition to fixes included in previously released cumulative updates, this update will resolve the following issues. When you play a DVD video in Media Center, a horizontal white line appears in some dark areas of the screen. For example, when you press the MORE INFO button on the Media Center remote, a white line appears on the bottom of some menu items. Then, when you close the More Info screen, the white line remains on the screen. When you use the ListMaker sample add-in that is included with the Media Center SDK, and you comment out all media types except Pictures, Media Center may crash. Program_name has caused an error and must be closed. We apologize for the inconvenience. If you were in the middle of something, the information you were working on might be lost. Please tell Microsoft about this problem. We have created an error report that you can send to help us improve Program_name. We will treat this report as confidential and anonymous. To see what data this error report contains, click here. The Media Center screen resolution is set to 720p (High Definition) or to a higher resolution. The DVD video is copy-protected by MacroVision. You can download the update here or via Windows Update as a Recommended Update. You've seen them on television while watching tennis. They are the ones that run across the tennis court to pick up the tennis ball after the point has ended. They also that supply the server with tennis balls. Yes, you know who I am talking about, the ball crew at a tennis match. The ball crew play a very important role in tennis matches; however, they do more than what is shown on television. Not only do they retrieve and supply balls for the players, but members of the ball crew also help stock the court with towels, balls and water, set up the scoreboard, and operate the on-court clock. Ideally, the ball crew members should never really be noticed. Pulling a Kramer would be a bad thing (i.e. running into and injuring a player during the final match of the US Open). If you are interested in becoming a member of the ball crew for the Rogers Cup tennis tournament in Toronto, here is some general information about the selection process. The ball crew for the Toronto event comprises of about 80 people every year, and of those 80, more than half of those positions are reserved for returning ball crew members. As a result, approximately 30 of the remaining positions are filled via a tryout process. With typically more than 200 candidates attending tryouts, competition is tight for these highly prestigious positions. There are also age restrictions for ball crew members, as need to be within the ages of 12-18. New members are further restricted to the ages of 12-16. There are usually two tryout stages, and those that are selected have further practise sessions prior to the tournament. Physical Skills - a ball crew member need to be able to catch, throw and run. These skills are required in order for a ballcrew member to function efficiently and unnoticeably on the tennis court. Hustle - a ball crew member needs to realize that at the end of each point, the ball isn't going to magically roll to them. They have to quickly get the ball, and then get back to position. Slackers won't make it far in this selection process. Attention to detail - a ball crew member needs to always be aware of where the tennis balls need to be, after every point. They need to know the score and act accordingly (i.e. which side of the court to be on, when to change balls, positioning at net during serves, position of other ball crew members etc). The first tryouts for the Toronto tennis tournament occur in the spring (late April/early May) before each tournament. For those that are interested, information and application forms for ball crew tryouts usually appear in early March at the tournament website (available through http://www.tenniscanada.com/). While most ball crew for this upcoming tournament are from the Toronto area, there are some that come from further away for this opportunity. Here is the story of an Oneonta, New York teenager who was selected to be on this year's ball crew. For other tennis tournaments, each has its own set of criteria and procedures for its ball crew selection process. For example, here is the US Open press release calling for ball crew tryouts, and this follow writeup describes what happened at this year's tryouts. And here is a website describing the ball crew selection process at Wimbledon. Check with your local tournament to see how you can become a member of their ball crew. Recent events at the Madrid Men's Tennis Masters Series event and Sony Ericsson Championships tournament for the WTA have courted controversy (excuse the pun) with their ball crew selection criteria. A couple of years ago, the Madrid TMS tournament, instead of having the 'traditional' ballcrew-type to pick up stray balls and hand towels to players, employed 19- to 28-year-old models to serve as ballcrew on televised courts. Despite protests, tournament organizers plan to continue using these models as ball crew for this year. Perhaps as a reaction to this move, the WTA is following suit, by having seven male models with tennis knowledge to act as ball crew at the women's end-of-season championship tournament, co-incidentally also in Madrid. Here are some pictures of the models performing ball crew duties. What do you think of this? Some argue that this takes away from the tennis (i.e. people should be watching the players, and not the ball crew). Others say that any publicity is good publicity. Who knows, if this idea really catches fire, would the Rogers Cup or other tournaments change their ball crew selection criteria to follow suit with what is happening in the two Madrid events? Many sporting events depend on the dedication and commitment of volunteers. These events vary in size, from your local softball leagues to global events such as the Olympics. Tennis Canada relies on volunteers to help with the Rogers Cup. For the Toronto event, there are approximately 900-1,000 volunteers spread over more than 30 different committees. Some of the volunteers are very visible, from your ballcrew kids on the tennis courts during the matches or ushers showing ticket holders to their seats; other volunteers work behind the scenes, from parking attendents helping direct people from their parking spots to the stadium or pass control personnel to keep unauthorized people away from sensitive areas. While their roles with each of these committees may differ, all the volunteers have a common bond; they are all energetic, enthusiastic, and team oriented tennis fans who have an interest in assisting at one of the premier summer sporting events in Toronto. With proceeds of the tournament earmarked toward growing the game of tennis in Canada, the efforts of all the volunteers today help to improve the game of tennis in Canada tomorrow. Commiting to work a minimum of 7 shifts which includes a minimum of 42 hours throughout the 9 days of the Tournament. New volunteers should be prepared to attend a Volunteer Fair which includes an interview. Attend a specific committee training session closer to the event. Note that some committees actually start work prior to the start of the tournament. As an example, the committee that I am in, the Transportation Committee, starts up three days prior to the first day of the Tournament to pick up people that come in early (i.e. qualifiers, or players wishing to come to Toronto earlier to practise). A tournament uniform which must be worn while you are on duty. A meal voucher for each shift worked. Free on site parking in a designated area. A photo badge identifying you as a volunteer entitles you to site admission and access to a specific volunteer seating area for the duration of the tournament. The equivalent of a pair of tickets for up to 5 sessions in the Centre Court Stadium (depending on the number of shifts worked). Invitation to an informal party, to be held after play on the final Sunday of the tournament, to celebrate the success of the event and for all your hard work. While the tangible items are a nice gesture, I feel that the intangible benefits is what really keeps our volunteers coming back year after year. While I've only been volunteering for ten years, there are other volunteers that have done this much longer than I have. For example, for one of the co-committee heads my committee, this year marks the 30th year that she has been volunteering. It is an opportunity to share your knowledge and expertise with others, along with picking up new skills. It is also an opportunity for you to gain confidence and self-esteem. Depending on what you are looking for, volunteering can involve a large degree of responsibility. With this opportunity. one can exercise leadership, develop problem-solving skills and be creative. If you are interested in tennis and live in the Toronto-area, perhaps you might want to volunteer in the future. If so, visit http://www.tenniscanada.com, pick the appropriate tournament for the calender year (either the men's or women's tournament, which ever one is in Toronto) and then goto the Tournament Information link. On the page that opens, you will find a link that takes you to the Volunteer program. If you have problems finding this link, feel free to contact me and I can point you in the right direction. The list of celebrities that will be participating in the Celebrity Tennis Challenge at the Rogers Cup (Toronto) has been announced in this Tennis Canada press release. To further elaborate on my previous blog entry that discussed this event, 16 world-renown celebrities will be taking to the courts on Thursday, August 10, 2006. Stars of the music, entertainment, food, and media industry, as well as superstar athletes, will be competing against each other to benefit the floor tennis program, which offers young children in poor families the chance to learn to play tennis. The 16 competing celebrities will engage in a round robin consisting of four 20-minute doubles matches at a time. All matches will take place on the four practice courts to the east of the Centre of Excellence. 16 schools and/or community centres have been earmarked to receive the floor tennis program. The complete list can be found at the press release. My money is on Nestor/Knowles... but in the end it doesn't matter, as it is the kids in the schools/community centres that win most of all. 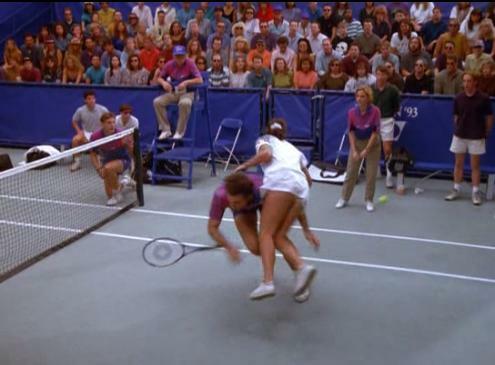 To Joe, who wanted Doug Gilmour in the Celebrity Tennis Challenge, sorry, looks like it isn't going happen. One of the most common newsgroup questions relates to Media Center 2005 and domain support. Why is this? Let's provide a bit of background. When Media Center 2002 (code name Freestyle) was released, Media Center was a complete superset of Windows XP Professional. This meant that Media Center could join domains, and cache credentials, along with all of the other good stuff that Windows XP Professional could do (Remote Desktop, Encrypting File System, etc). When Media Center 2004 (code name Harmony) came out, things remained the same. Feature differentiation between the Windows XP Media Center and Windows XP Professional so that a new price point could be created. Support for Media Center Extenders required Fast User Switching, something that could not be done when a computer is joined to a domain. By removing domain join and cached credential support, Microsoft was able to offer Windows XP Media Center 2005 to OEMs at a lower price compared to Windows XP Professional. By lowering the price point, Microsoft was hoping that home users could get most of Windows XP Professional's features (i.e. everything except for domain join and cached credentials, which arguably are not features that are used by home users anyways) at a lower cost, and grow the Media Center platform in the market segment where it was destined to have the most growth... in the home market. Comparatively speaking, while one could envision scenarios where Media Center could be used in a business setting, it was clear which choice had more immediate upside. Given the growth of Media Center sales over the last year or so, this decision, in light of the above factors, seems to have been the right one. With Media Center Extenders first appearing in the Media Center 2005 time frame, the current Extender platform required Fast User Switching to be enabled on the Media Center host computer. By not supporting domain joining in Media Center, this would have been one less scenario for Microsoft to have to deal with. Upgrade from a Media Center 2002/2004 machine that had previously been joined to a domain. This upgrade path is available from either discs provided by your OEM (i.e. HP, Sony, and other MCE 2002/2004 manufacturers offered this for a limited time) or from MSDN discs. This method of having a Media Center 2005 machine joined to a domain is supported by Microsoft; however, once the machine is removed from a domain, domain join ability is removed (e.g. if you manually remove the machine from the domain). During the Media Center 2005 setup process, if you have a network card that is supported by the in-box drivers, you are given the option of joining a domain. Why is this? The Windows XP Media Center 2005 setup is essentially the same as Windows XP Professional, with the difference being determined by the product key that is entered. When a Media Center product key is specified, the specific Media Center bits are installed (you'd be prompted for 'Disc 2'). It appears that Microsoft either missed this networking prompt, or felt that fixing that issue might have introduced potential issues such that it was not worth fixing (as the Media Center specific bits come after this prompt). As such, there seems to be tacit support from Microsoft for this method. Note that if you remove the machine from a domain, you will not be able to subsequently join a domain again. Enterprising people suspected that there was a way to 'fix' this issue via a hack. They were correct. By changing some protected registry keys, it is possible to permanently bring back domain join/cached credential support. There is a certain procedure to get around the protection on these registry keys, for more information about this, details are available at this site. This method is definitely NOT supported by Microsoft. While the site claims that Extender support works, I suspect that the person testing it did not have both the extender and a local user logged in at the same time (as that definitely would require Fast User Switching support). I would advise people using this hack to avoid using Extenders, as there are some interactions that are not within the realm of support. With the impeding release of Windows Vista, the issue of having both domain support and Extender support is resolved. As I mentioned my 'Media Center and Vista Editions' blog entry, there will be two Windows Vista Editions with Media Center features. Windows Vista Ultimate will have both domain support and Extender support, while Windows Vista Home Premium will not have domain support (it will; however, have Extender support). Home users who don't need domain support would likely go with the lower priced Home Premium SKU, while Business/Power Users who need domain support would have the Ultimate SKU. Similar to other sporting events, sponsors are vital to enhancing the overall experience of the audience. The Rogers Cup tennis tournament has a group of sponsors that assist in various aspects of the tournament; all of these sponsors are listed here. Through the sponsorship assistance of State Farm Insurance, spectators will receive FREE admission throughout all of the Sunday, August 6, 2006 session. This special promotion is called the 'State Farm Family Day'. This family-orientated day aims to be a fun filled, action packed day. Scheduled programming includes games, cotton-candy, face painting, a scavenger hunt, wheelchair tennis demonstrations and on-court clinics with ATP players in addition to regularly scheduled matches. This year's Rogers Cup tennis tournament, held in Toronto between Aug 5-13, is shaping up to be quite a special event. Five former champions highlight the ATP Tour's return to Rexall Centre, Toronto's new tennis stadium which opened two years ago. The world-class field is highlighted by the Top 50 players on the ATP Tour. Competitors will include defending champion and two-time French Open winner, Rafael Nadal, 2004 Rogers Cup titlist and world No. 1 ranked Roger Federer and 2003 tournament winner Andy Roddick. Also included in the Top 50 entry list is three-time Rogers Cup champion, Andre Agassi. The American tennis legend will be making his final appearance on Canadian courts following the recent announcement of his retirement which will take place at the conclusion of the 2006 U.S. Open. What makes this year's edition of the Rogers Cup a really special occasion is that this year marks the 125th anniversary of the Canadian tournament. It is the third-oldest tennis tournament behind only Wimbledon and the U.S. Open. As such, Tennis Canada is planning to hold a 125th Anniversary Celebration during the Monday (August 7) evening session. Expected to be part of this celebration is Roy Emerson, a former singles and doubles champion of this event. In addition, on this same night, with Andre Agassi making his final competitive appearance in Canada, Tennis Canada is finalizing plans to celebrate his career. This should definitely be a night to remember. Another unique event that Tennis Canada is organizing for this year's tournament is a Celebrity Tennis Challenge. This celebrity challenge aims to raise money for Tennis Canada's Tennis Matters initiative. This money will go toward financing new indoor tennis programs at 14 schools and community centres in the Jane-Finch area. These programs will cost about $500-1,000 for each location so every bit helps. Each location will receive racquets, balls and nets, plus instruction from Tennis Canada coaches. You can even pledge your support now, by visiting the Give a School Floor Tennis site. Celebrities that have been scheduled to play in this Challenge include Ontario Health Minister George Smitherman, NHL star Jason Spezza, former Toronto Maple Leafs forward Gary Leeman, Canadian Idol judge Jake Gold, Jim Cuddy of Blue Rodeo, CFL commissioner Tom Wright and Rogers Cup tournament director and former ATP pro Grant Connell, with the possibility of more names to be announced as we get closer to the tournament. Who knows, perhaps the volunteers in my Transportation Committee will get a chance to drive one or more of these celebrities! Now a question for you readers out there... I mentioned 4 of the 5 former champions based on the Top 50 entry list that are slated to come to Toronto in this blog posting. Who is the 5th former champion? With the advent of technology, its integration into sports has come at an astonishing pace. We have seen technology used to aid in sports training (heart rate monitors, wattmeters, training programs etc), improve the field of play (artificial playing surfaces, covered/indoor stadiums, etc), enhance sporting equipment (tennis racquets, synthetic material for basketballs, hockey sticks, etc) and expand media coverage (newspaper, radio, television, internet etc). One other area where technology has played a large role is that of officiating. Different sports have embraced technology at various levels. This difference can be seen between sports like baseball or soccer, where there is minimal technology used to aid in officiating, to sports like football and hockey, where video replay can be used to aid officials. Over the last few years, tennis has been one of the sports that faced pressure from the public to adopt technological aid to assist in line calling. This pressure has been growing as a result of the increasing speed in the game, along with the increasing number of controversial line calls by officials. Perhaps the breaking point in this came in the form of the 2004 women's U.S. Open quarterfinals match between Serena Williams and Jennifer Capriati. 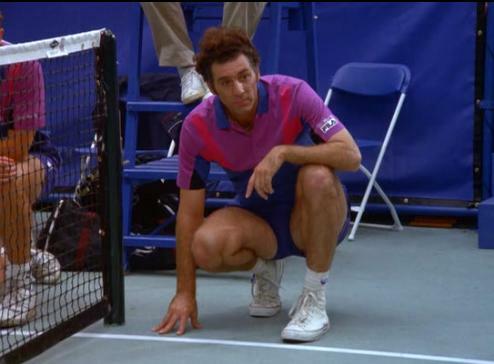 In the third set of that match, there was an incorrect chair reversal of a call made by the linesperson which eventually cost Williams the match against Capriati. The mistake was acknowledged when the tournament's head of officiating removed that official from further matches and personally called Serena Williams to apologize for the bad call. 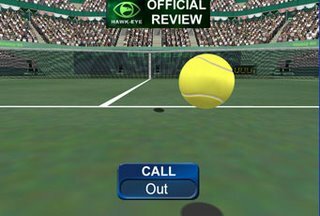 In March of 2006, tennis introduced technological aid in officiating in the form of instant replay technology at the Nasdaq-100 Open in Miami. Following the great feedback from players and fans, the use of electronic line calling will be expanded to include Sony Ericsson WTA Tour and ATP events participating in the U.S. Open Series. This will culminate in the debut of electronic line calling at the U.S. Open, a first for a Grand Slam event. Hawk-eye uses multiple cameras placed around the court to track the players and the ball. These movements are then processed by computers. Hawk-eye takes ball skid and ball compression into account and is accurate to 2-3 mm. It is important to note that Hawk-eye isn't entirely new; however, it has been refined over the years to such a degree that the confidence level in the system is high enough for use as an officiating aid. The use of this tracking technology also allows for a new range of statistics to be captured and presented to the viewing audience; something that many tennis viewers may already be familiar with. In addition to calling lines, statistics that Hawk-eye can measure include speed of the ball at any point of a rally, service comparisons (i.e. service patterns, direction and depth of aces, placement of 1st and 2nd serves etc), bounce points of the ball, percentage of time a player spends in a region of the court or an approximate measure of distance that a player has run throughout the match. Statistics from the 2005 Wimbledon Final between Roger Federer and Andy Roddick. We can see Federer targeting the Roddick backhand side on second serves. 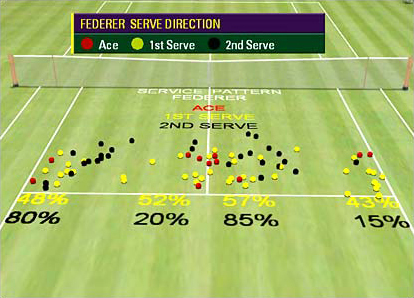 Also note the placement of Federer's aces on Roddick. As part of this system, new video boards will be a large part of the in-stadium atmosphere on centre court for instant replay coverage, statistics, fan interaction, contests and corporate partner recognition. You may even see players sneak a peak at their stats during changeovers, in order to make in-game adjustments. The television broadcast is also enhanced by this system, primarily through the usage of the various camera vantage points around the court, and the display of statistics during the course of the match. With all this technology in place, there is always an associated cost. The system costs approximately $20,000 to $25,000 USD for a court per week (excluding the video screens in the stadium). As a result, in Toronto's Rexall Centre and Montreal's Uniprix Stadium, this system will only be set up on the main court. Advertising opportunities will help to defray these costs, as partners can associate themselves with this technology (think of the Hawk-eye brought to you by "..." or these Stats are brought to you by "..."). Once a player challenges a line call, an official replay will be provided simultaneously to the television broadcast and in-stadium video boards, allowing players, officials, on-site fans and television viewers the opportunity to see the live results of a player challenge. Most players have embraced this system. Perhaps the most notable exception is Roger Federer. "What is happening is madness," Federer said of the decision to use the Hawk-Eye computer system on the main court for the Nasdaq-100 Open. "A pure waste of money." Perhaps with time and/or further refinement of the system, he will come around. Here are reactions from other players and broadcasters. In my 20 years in professional tennis, this is one of the most exciting things to happen for players, fans and television viewers. This new technology will add a whole new dimension to the game. The ball's moving so fast these days that sometimes it's impossible for anyone to see, even a trained official. With instant replay we can take advantage of technology and eliminate human error. Having just a few challenges will make it both fun and dramatic for fans at the same time. It takes a lot of pressure off. You don't get so angry. If you think a call is incorrect, you don't spend extra games thinking about it. It's really quick. I remember people were complaining about maybe it throwing off the timing and rhythm of the match, but it didn't do anything like that at all. If anyone's been listening to my commentary the past year then they know I'm in favour of using replay. I think it will make tennis more interesting. I'm thrilled about it because tennis needs it for a variety of reasons, one of which, the main one being the viewing public, the second being the live audience and thirdly just because we don't need more repetitions of what we've seen over the past year with people getting hooked out of matches. I'm looking forward to seeing this system work at this year's Rogers Cup tournament in Toronto. In the future, I'd like to see them go away from a challenge system. Instead, all close calls should be reviewed, since the results are available to the chair umpire pretty quickly. Regardless, this is definitely another positive step forward for tennis. With Ontario's electricity supply struggling to meet demand, especially over the summer months, Toronto Hydro has introduced two incentive programs, which also yield the benefit of having to pay for less electricity due to decreased consumption. Residential and small commercial customers (less than 50kW per month) who have resided at the same premise since at least September 1, 2005, can participate in the Toronto Hydro Summer Challenge. As customer meters are not necessarily read on July 15 and September 15, Toronto Hydro must derive a daily average kWh consumption that will be applied during the Challenge period. Based on actual meter reading periods, Toronto Hydro will prorate the total kilowatt hours consumed during the billing cycles that span the summer months. The daily kWh average for 2005 will then be normalized using a seasonal adjustment factor of 92 per cent, based on a 30-year average of summer temperatures, to account for the hotter-than-normal summer temperatures experienced in 2005. For additional information on the Toronto Hydro Summer Challenge Program and tips on how to reduce your use, visit www.torontohydro.com/challenge. The second incentive introduced by Toronto Hydro is the peakSAVER AC program. PeakSAVER is an innovative program designed to help you reduce the demands on our electricity system. A peakSAVER switch will be installed on your central air conditioner. During peak times, like hot summer days, a signal will be sent to cycle your system off and on to reduce the amount of electricity needed by the province. You won't even notice a difference, and you're doing your part to conserve without any further time, effort or cost. Participation in this program program will not cost you anything and there are no maintenance costs. As an incentive, if you sign up for the standard peakSAVER Program, you will receive a $25 cheque. Over the last week, I haven't been able to blog much because I've been busy. There is a tremendous amount of time and effort put forth in staging a tennis tournament of this magnitude and volunteers are essential to its success. Approximately 1000 people volunteer at the Rogers Cup held at the Rexall Centre each year. We are looking for energetic, enthusiastic, and team oriented tennis fans to help volunteer as we bring the world's best tennis players to the premier summer sporting event held in our great city. There are more than 30 committees from which to choose from, including centre court control, transportation, pass control, greeting patrons, and many more. During the week you will not only get the opportunity to see some exceptional tennis but you will also make new friendships, be part of the fun and excitement, and have memories that will last a life-time. I have been volunteering at the tennis tournament in Toronto for the last ten years, all of those in the Transportation Committee. However, this year is unique, as it is my first year as a Committee Head (alongside two other returning Committee Heads) of the Transportation Committee. As a committee head, I have a few more responsibilities this year. Essentially, this can be broken up into two parts - Pre-Tournament and Tournament Responsibilities. Prior to the tournament, there is quite a lot of work that needs to be done. This ranges from liaisoning with Tennis Canada staff members, such as the Volunteer Co-ordinator, or the Tournament Operations Manager, to ensure that all the appropriate transportation committee-related resources are in place (i.e. personnel, supplies, arrangements for tournament vehicles, etc), other Volunteer Committee Heads, and the volunteers in my committee (i.e. scheduling and other general items). The goal of pre-tournament planning is to come up with solutions to deal with everything that is expected to happen during the tournament. By identifying various events and developing optimal solutions to these expected events prior to the tournament, more time is left over to deal with unexpected events during the tournament itself. Of course, one hopes that with enough pre-tournament planning, the number of these unexpected events is minimized. However in practice, things always come up. Items of this nature for our committee include the setup of our communications systems for our drivers, preparing information handouts to our drivers or putting in place the processes required to ensure that player/v.i.p./etc needs are best met. This past week, I have been working on the scheduling of the volunteers in my committee. With approximately 1085 shifts needed to be filled by 127 volunteers, it isn't exactly the simplest of tasks. The best analogy I can think of is that this scheduling task is like putting together a puzzle, where the goal is to fill our needs (the 1085 shifts) by efficiently utilizing all the resources that are available to you (here the resource is the volunteers, each having unique characteristics, such as the date and times that they are available, various preferences as to tasks that they are comfortable in doing, how many shifts per day etc). Doing this in an efficient manner is key, as there is a cost factor involved. At the end of the day, Tennis Canada is still a 'not-for-profit' organization dedicated to growing the game of tennis throughout Canada, from grass root programs to high performance development. If they burn up all their costs running this tournament, Tennis Canada would have a difficult time fulfilling its mandate. Luckily, I have some assistance in the form of ScheduleSource TeamWork software from ScheduleSource, Inc. However, it is not a completely automated task, as I would say that the software completes the task to about 80% completion. This is due to some unique characteristics of the tournament that the scheduling software does not easily accommodate. lack of a effective method of re-publishing of the scheduling output from the software to a set of webpages. All these above items require manual intervention by me to re-concile, so as a result, I haven't had time to blog about anything in the past week. I am just about done this task, so I'll be blogging more in the coming days. Output the results into a webpage for employees to access. I realize that this set of requirements is not exactly run-of-the-mill, but perhaps someone knows of some software that can accommodate all these criteria. If you know of any, please tell me! Over the next couple of weeks, as we get closer to the tennis tournament, I will blog about some of the things that I do during the tournament. Among these items include managing the transportion of players from the tennis stadium to their hotels, picking up players or celebrities from the airport, or managing the volunteers that are needed to perform these tasks. If there are other aspects of my position that you'd like me to blog about, please leave a comment and I'll see what I can do. Today was the final match day at The Lawn Tennis Championships at Wimbledon (otherwise known as Wimbledon or The Championships) for 2006. The traditional showpiece match on this day is the Gentlemen's Singles - Finals, contested between Roger Federer and Rafael Nadal. Roger Federer won this match in four sets (6-0, 7-6 (5), 6-7 (2), 6-3). Federer has now won the last four men's singles titles, matching the likes of Laver, Sampras and Borg as a four (or more) time winners of the Wimbledon Men's singles title. Nadal has the one thing Roger doesn't: balls. ... Sports is about balls and about heart and you don't find too many champions in any sport in the world without heart or balls. He might have them, but against Nadal they shrink to a very small size and it's not once, it's every time. Look. There's many former players, many experts, who think they know everything. Sometimes they're right, but they can also be wrong. You can't always listen to them, especially as a player. From a former top player -- almost a legend of the game -- to hear stuff like this is obviously very disappointing. I thought I got along well with him; I probably still am, because he never told these things to my face. Next time I see him, maybe I'll say something. Or maybe he's not a man to be around for me. Because if you say stuff like this? There's professional and there's friendship, but if you cross the line too many times eventually you're going to lose your friends. That's maybe what he's doing. I have attached links to a few commentaries that were produced during the French Open. In all three commentaries, Mats talking with a reporter from L'Equipe about something that struck him in the day's events. After Federer's performance today, I wonder if what Mats will have to say. For those of you who read my previous blog posting 'AMD X2 CPU Issues with Live/Recorded TV in Media Center', and are affected by the described issue, it may interest you to note that a new version of the AMD CPU driver (version 1.3.2) came out recently. I accidentally came across this new revision, just as I had found a changelog/documentation for version 1.3.1. You can download the latest AMD CPU driver for the Athlon 64 (also for the Opteron, Sempron and Turion 64) direct from AMD through this link. This driver is for Windows XP and Windows Server 2003 Version (x86 and x64 exe). I will post a link to a changelog/documentation for the latest version (1.3.2) as soon as I can find it.